Today's Artist Crush feature is an interview! Danielle is the powerhouse and creative genius behind The Merriweather Council. She creates one-of-a-kind whimsical embroidered pieces and patchwork art. She has taken Etsy by storm! I'm so glad she let me pick her brain. Your wishbone embroideries are fantastic collectible art pieces - portable, abstract, colorful and unique. You once compared them to poems. Could you tell us a bit about the creative process behind these? When you start one of these pieces, do you have a plan for the finished artwork or does it grow organically? I'm not much of a planner - I just sort of pick whatever colors strike me at the moment, most of the time though they are inspired by the idea or memory of a place or time. Very generally speaking though. For example, I did a hoop once called stormy Atlantic which I made one weekend while my family was having a get-together in Montauk, NY which is right on the ocean and it was a very windy, cold, dark, dreary day. That is sort of what the hoop turned out looking like as well. But there is no initial plan and I don't pick colors or draw patterns out beforehand. When you were starting out as an artist, was your work always abstract, or did you go through a more "realistic" phase? 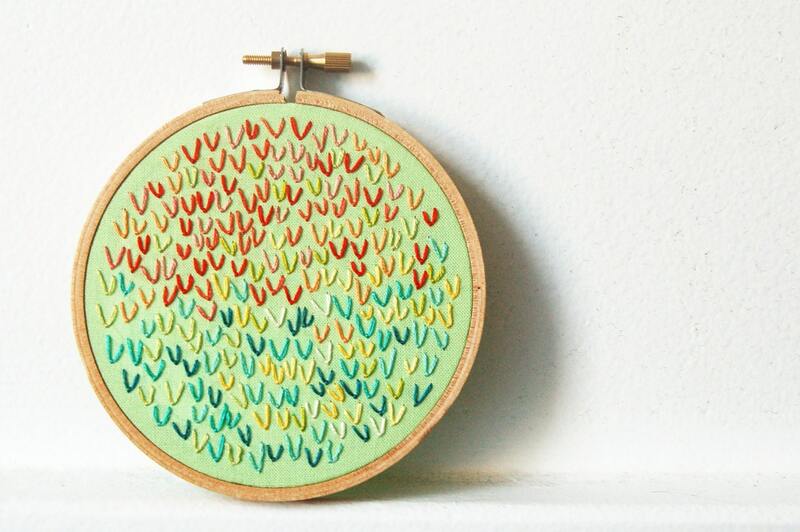 Was there a medium you created in before finding embroidery, or has that always been your medium of choice? I always preferred abstracted things - but I was trained as an artist in the traditional sense since high school so there wasn't too much freedom in the work I did until I got to sophomore year of college. I hate drawing and I hate trying to make things look realistic. Whenever I got the chance in high school I opted for collage works or line drawings, as I moved up the ranks I found this to be more and more my method, I was a builder more than a painter, I preferred to assemble bits of things rather than start with a blank canvas so to say. And eventually I ended up with a degree in 3D fine arts. Embroidery didn't come into the picture until college though. I always liked fabric and thread and yarn but these materials didn't really fit in with what I was learning or being taught until just a few years ago. Those materials weren't considered "real art" materials until I was in college. You've talked about your work being inspired by feelings and memories, which makes each wishbone hoop very personal. Did you ever create one you couldn't part with? If so, can we see a picture of it? I made one once that I decided to keep. Just once though. It was light purple - like a lilac color - with bright blues and red and yellows on it. It looked like a bag of tropical skittles. I don't have a photo of it but it is hanging in my apartment - which I am not currently at. 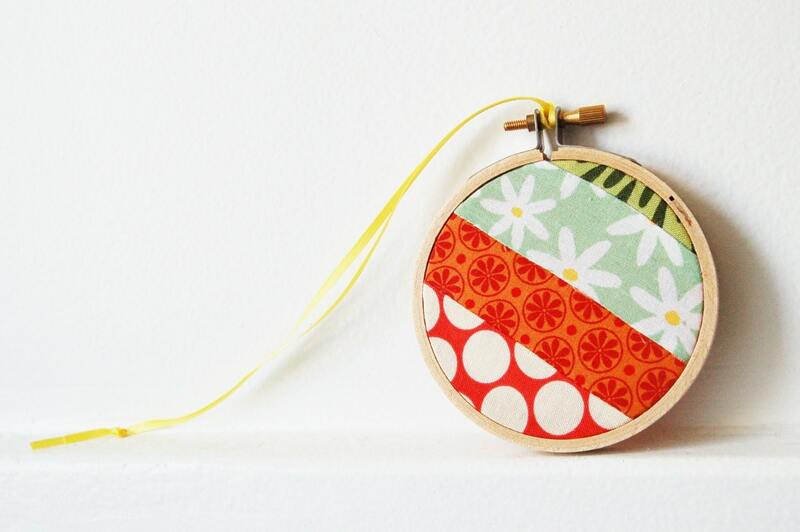 You also make adorable patchwork hoops, which I've come to think of as mini fabric collages. Where does the inspiration for these come from? Those started as a way to use all the small bits of fabric (mostly vintage) that I had that I couldn't find anything else to do with. I wanted to use them but most of them were too small to do anything other than patchwork with, and because I am obsessed with hooping things, that was the natural way of it. I've had the pleasure of watching your art and business grow exponentially. You've been featured in magazines and on the Today Show, yet you're still genuine, down to earth, and incredibly sweet. What has this last year been like for you, and what are some of the most important lessons you've learned? Well, thank you! I think the past year taught me that good things happen if you work really hard but also that even if you aren't totally prepared for something you will figure it out when you need to. I hope that's not the most boring answer of all time. Interesting question... I guess I wish people knew it was more complicated than it may seem, but isn't everything? Could you show us a picture of your work surface? Thank you Danielle! I can't wait to see what this year has in store for you! You can check out her website and perhaps pick up one of her popular embroidered initial necklaces. After this interview was done, Danielle was recruited by the Etsy folks to become an official Etsy Educator! Check out her blog to find out about the Etsy classes she will be teaching!